One of the primary factors by which you should judge a retailer is on its return policy. It shows that they are committed to customer service and that they stand by their product. If you are unable to request or secure a refund, other alternatives are available. It is essential that you have these avenues of recourse, given that consumers return over $264 billion worth of merchandise every year. If something goes awry with your purchase and you can’t request a refund from the website, look for the “About Us” or “Contact Us” section of the website for email addresses and phone numbers. Then, call the merchant’s customer service directly – often, a webmaster is associated with the website, and the merchant only has a moderate role in keeping it running. It should not take more than 5-7 business days for them to return your call, and fewer to return your email. If they value your patronage, a refund will be quickly issued. Sometimes, a retailer will try to give you the “run-around.” When you request a refund, if you feel that the communication isn’t fruitful or that you can’t get a timely response, then it’s time to escalate. Investigate what options the bank that issued your credit card provides; contact their customer support group to determine their recommended course of action. Depending on your dispute with the merchant, you may be required to complete a set of forms and/or follow other procedures set forth by your issuing bank in order to obtain a refund. When your efforts in securing a refund or customer satisfaction have failed with the merchant, iCan4Consumers provides a quick and easy option to the above step for contacting your issuing bank. iCAN4C is a consumer-friendly option for requesting a refund for any online credit card purchase. There’s a no-fee guarantee, which comes with ironclad privacy safeguards. 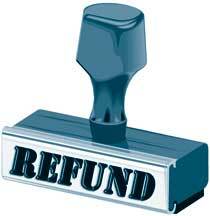 To request a refund, you need only visit their website and enter transaction details. iCAN4C has many businesses in its network and can usually obtain refunds within one business week (5-7 days). The merchant only needs to be a part of their network for you to receive your hassle-free, no-cost refund. Check them out today!